How do you know if you have the wrong size spring or springs on your garage door? Why does it matter? The wrong size spring can cause very serious problems with your garage doors. Below and in the video, we explain how a spring that is too small, or too large, can cause safety issues. A properly fitted spring or springs will create a safe, balanced garage door. A spring that is too small or too large can damage your opener, wear on your cables, cause a safety hazard, and more. 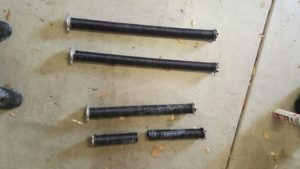 The solution to replacing a garage door spring, is first identifying the problem. If the issue is an ill fitting spring, you first need to determine the proper size for your specific door. In the video below you see two cases of improper spring size. In the first example, the spring is too small. When the spring is too small, the door is way too heavy. Opening and closing the door with springs that are too small can end up damaging your garage door and your opener. In the second example, the springs are too big they are also too strong for the door. This causes excessive force, which can ultimately damage your door and your opener, as well as be unsafe for use. Notice in both examples how difficult it is to raise and lower the doors when the wrong size spring is used, compared to how easy it is when they are fitted properly. Extension springs and torsion springs are the two kinds of garage door springs you’ll find in garage doors. Torsion springs turn as you open and close your garage door. Extension springs do as their name suggests. They extend as your door moves, and helps to balance your garage door. Springs in general last about 10-14 years or 15-20 thousand cycles. Perfect Solutions recommends replacing all springs on your door, even if only 1 snaps or breaks. This we believe is the most cost effective solution long term, and ensures the safety of your garage doors. Generally if one spring breaks, the other is not far behind anyway. Many garage doors only have 1 spring installed. This is fine, but we recommend upgrading to 2 springs. It is less expensive long term, and also increases the overall safety of your doors. High cycle springs are another recommended upgrade. This increases the number of cycles your garage door can perform before the springs need replacing again. 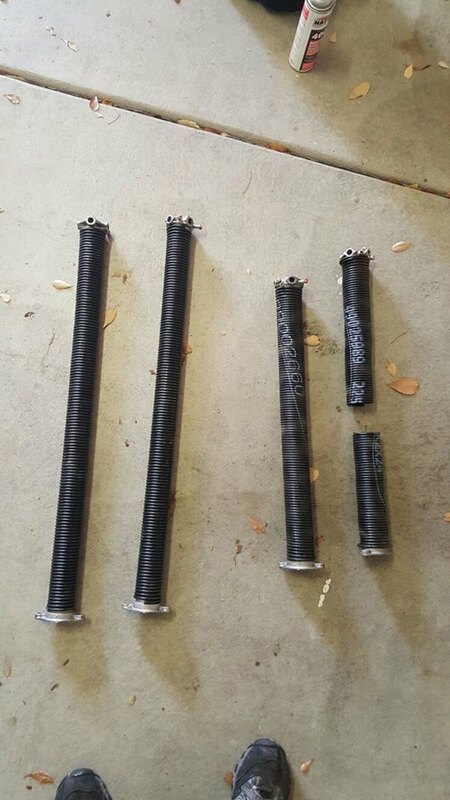 When replacing the garage door springs it is really important to use the right type and size of spring. If it’s too small the door will be very heavy and might fall or damage the garage door opener. Also the spring might snap faster. When choosing the right size of garage door spring the technician will have to figure out the weight of the door by using a special type of measuring tool. Double spring system – made for two car garage. Safety – When using a single spring system there is always the risk that the spring might snap while the door is traveling up or down. In this case if it happen the door will fall rapidly and might hurt someone or damage property. Life span – Single spring will not last as long as a double spring system. The Door might be a bit heavier which will wear out the automatic opener with time. If a spring snap while the door is traveling the other spring will support the door and it should not fall down. It is very rare for both springs to snap at the same time. Double springs system will outlast a single spring system by many years sometimes even twice as long. The door will be so light that your garage door opener won’t have to make much effort to lift the door up or push it down. Here is a picture of the old spring vs the new springs we installed. This door in El Dorado Hills CA, is only 4 years old and the spring already broke.